Sept 2018 – Successful business networking is all about making connections and nurturing these newly-established relationships. It also happens to be one of the most powerful and cost-effective marketing tactics available, especially for entrepreneurs who lie awake at night worrying about not having enough customers. According to Bloomberg, this is one of the contributing reasons why 80% of businesses fail within their first 18 months. Running a business is difficult enough so it is important to surround yourself with positive and uplifting people in your network. This can be done in a variety of ways and either online or offline. Offline networking involves attending business networking type of events which will allow you to establish and nurture professional relationships with like-minded people. It is crucial to be thoroughly prepared when attending these events and this goes further than simply handing out business cards. 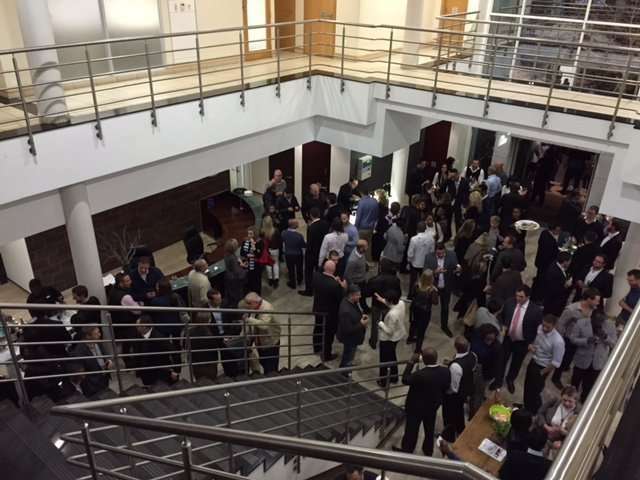 The Business Exchange holds a number of monthly business networking events which are well attended by its tenants as they have seen the value of these events. However, to create an effective networking relationship, you need to maintain close ties with relevant business professionals on a regular basis, which includes online networking using social media platforms such as LinkedIn, Instagram, Twitter, Facebook, email newsletters, etc. An effective online strategy ensures that you understand what you want to achieve and how you want to achieve your online marketing efforts. In order to be effective on the various social media channels, you need to regularly communicate relevant information and monitor this content, as well as to respond to your network’s online conversations. Connecting on a personal level in business, through networking has never been more important or easier and the benefits are tremendous. One of the most obvious outcomes of business networking is that once established, your extended network will provide you with very high-quality leads which have great potential of becoming a future business if nurtured correctly. Another valuable result of effective networking is that it raises brand awareness – enabling both your personal and company branding to become more visible in the market. This is beneficial in that your immediate network will remember your brand when they, or a member of their own business network, require your products or services. Online networking via social media can greatly assist in you becoming recognised as a thought leader within your industry. This is done through publishing regular, relative, informative and unique content relating to your industry. This may include corporate blog articles or white papers. In addition, as people tap into your expertise so you too can tap into theirs and problem-solving becomes a lot easier. Whether you are attending an event or following a formal online marketing strategy, both will serve to decrease your initial marketing costs. This is especially important for entrepreneurs who are starting out on a new business venture. In summary, business networking, whether online or offline, is all about relationship-building. Relationships should be mutually beneficial in order to maximise their benefits. By continually connecting with new people and cultivating these professional relationships, you will be able to successfully leverage your network and help your business grow, while staying abreast of development within your industry.